Halloween hasn't arrived, but the world's most famous theme park is looking to get a jumpstart on the fa, la, la-ing. 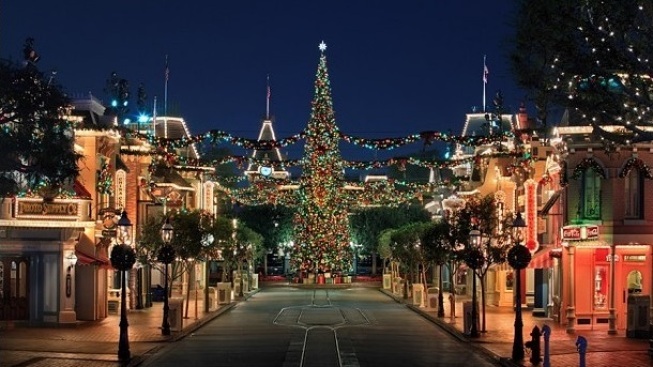 Holidays at Disneyland Resort will debut on Nov. 13, 2015. Halloween Time opens on Sept. 11. JACK SKELLINGTON KNOWS: September through December -- or, let's be honest, early January -- is a whirl of bunting and lights and decorations and fresh costumes and special events at Disneyland Resort. But just because Halloween arrives before the December holidays on the calendar doesn't mean that The Happiest Place on Earth always sticks strictly to the order of things. Look to one of its most famous seasonal attractions, The Haunted Mansion, for further guidance on this calendar-twisting topic. The New Orleans Square attraction transmogrifies into Tim Burton's "The Nightmare Before Christmas," a treat that salutes both the most haunting of holidays and Christmas, too. So it is no surprise then that Disneyland would draw back the curtain on its Holidays at Disneyland Resort dates a week ahead of Halloween Time making its official Sept. 11 debut. NOV. 13, 2015... is the opening date for all things candy cane-y at both Disneyland and Disney California Adventure, so, as is tradition, the entire week of Thanksgiving -- one of the busiest for the resort -- will be fully decked out in its shiny baubles and minty charms. And, as is tradition, the holiday celebration will extend a couple of weeks past Christmas Day, with a Jan. 6, 2016 wrap-up. There've been no reveals yet as to what treats are in store this year, but count on those famous handmade candy canes to pop up at the Candy Kitchen on Main Street, and count on seeing a few toy soldiers, and Santa, too, in the daily parade. AS FOR HALLOWEEN? There's a lot going on, starting with the Sept. 11 kick-off. Mickey's Halloween Party, Ghost Galaxy at Space Mountain, Jack Skellington at The Haunted Mansion, and the giant pumpkin at Town Square are all tried-and-ghoulish hallmarks of the theme park's spookiest season. Ready for Halloween and then the holidays, one after the other? Well, since The Haunted Mansion smooshes them together to great success, we'll guess Disneyland will rock both distinct celebrations, even though they sit very close on the calendar. Still going on through it all? The park's 60th anniversary party, too.